Small-scale rotors are aerodynamically inefficient due to the high profile drag at low Reynolds numbers. An MAV based on cycloidal rotor may be proposed as an alternative to conventional helicopter based MAVs. In a cycloidal rotor since all the spanwise elements of the blade operate at the same aerodynamic conditions, the blade properties of all the elements can be set at its optimum efficiency. As the thrust vector of a cycloidal rotor can be instantaneously set to any direction perpendicular to the rotational axis, it may have more maneuverability as compared to a helicopter based MAV, which makes it ideal for highly constrained indoor operations. However, experimental data as well as analytical models on cycloidal rotor performance are limited, especially on the scale of MAVs. We have carried out testing of MAV-scale models to estimate the aerodynamic performance of cycloidal rotors under various flight conditions. Cycloidal rotors of diameter and span of 6 inches were built to investigate the effect of the rotating speed (RPM), amplitude of blade pitching, and number of blades on the thrust and power. Detailed wake measurements were also conducted to obtain the flow field under the rotor. 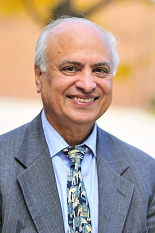 A simplified analysis was developed based on a streamtube momentum theory (uniform inflow) in conjunction with Wagner’s functions to account for unsteady aerodynamic effects. Thrust increased with the square of rotational speed, while power increased with the cube of RPM. Tests were conducted on both a six-bladed rotor and a three-bladed rotor and it was found that the six-bladed rotor only produced 30% more thrust than the three-bladed rotor at the same RPM and collective setting. No dramatic reduction in thrust was measured as blade pitch angle was increased to 400, indicating the importance of dynamic stall in a cycloidal rotor. Thrust predictions matched well with experiment for the three-bladed rotor, but were less accurate for the six-bladed rotor. This may be due to interference effect between top and bottom blades. The design went through a large number of iterations to reach the stage where the rotor could operate at a rotating speed of 2000 RPM without any mechanical problems. At an RPM of 2000, the rotor produced 145 grams of thrust, which appears sufficient for the cycloidal MAV to hover (using two such rotors). At the operating point, the power loading obtained was 5.7 grams/watt. The rotor was carefully balanced to make sure the vibrations were under manageable limits. Detailed pressure measurements were also made in the rotor wake using a pitot-static tube to obtain the flow field below the rotor. Based on the results obtained from the above parametric study and the aerodynamic analysis, a three bladed design with pitching amplitude of 40 degrees was chosen for the MAV configuration since it produced the best power loading (thrust/power). 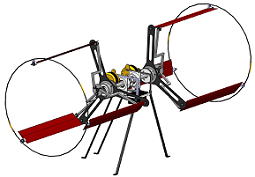 A conceptual design of the micro air vehicle using two cycloidal rotors was carried out. 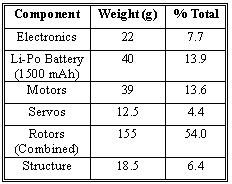 A weight breakdown of the vehicle components is provided in Table 2. With the understanding gained from these tests, a CFD-based refined theoretical model is being developed and will be validated systematically. The model will be used to design the cycloidal rotor for optimum performance at the desired flight condition.